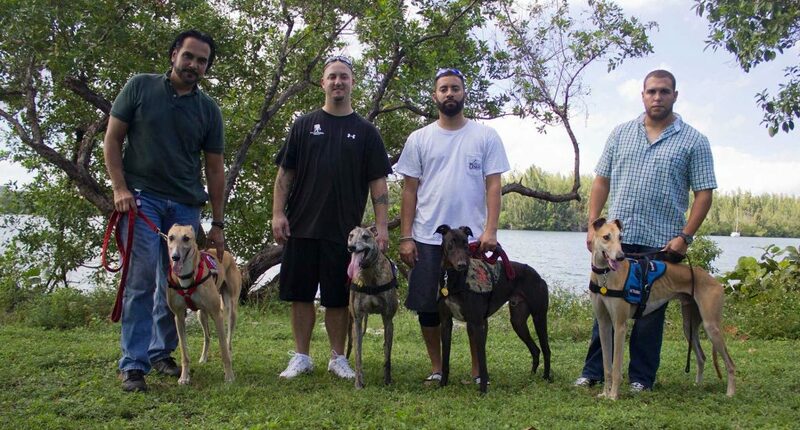 On May 25, U.S. Army Veteran Barry Offenburger became the proud owner of Hero II, a retired racing greyhound, as part of an innovative new program that pairs specially trained retired greyhounds with military Veterans who need a little help re-adjusting to civilian life. 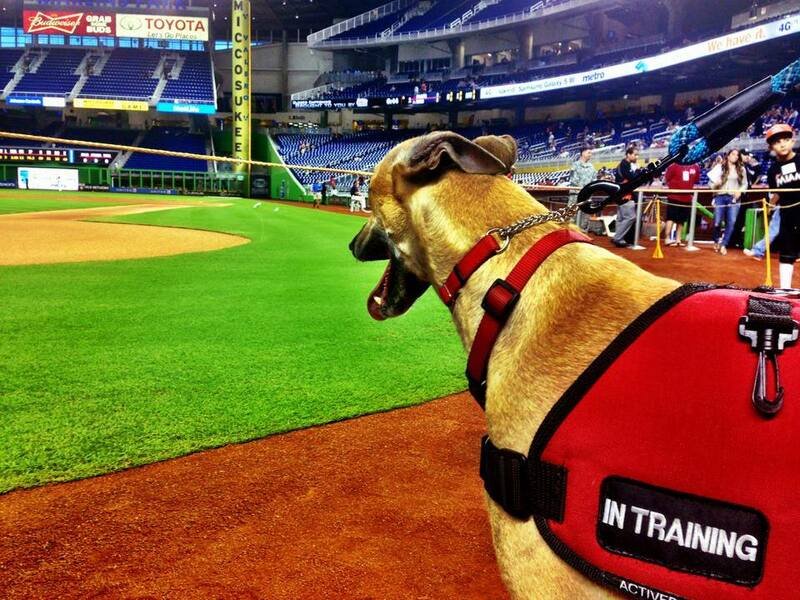 The presentation was held at Palm Beach Kennel Club (PBKC) in Florida. 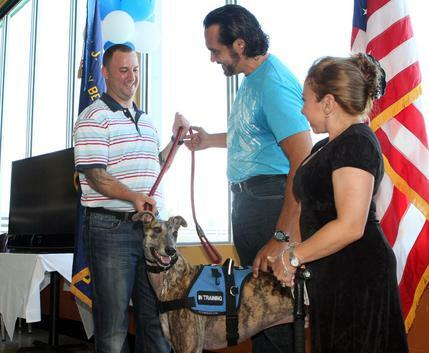 Afghanistan Veteran Barry Offenburger, left, accepts Hero II’s leash from Service Dogs 4 Servicemen founder Sara Donadei-Blood and trainer Daniel De La Rosa. Service Dogs 4 Servicemen founder Sara Donadei-Blood was joined at the track presentation by representatives of PBKC and Greyhound Pets of America Florida/Southeast Coast Chapter. The program is a joint effort of the three organizations. Offenburger, a Veteran of the war in Afghanistan, suffers from post-traumatic stress disorder (PTSD), an illness that affects as many as 12 percent of the troops who fought there and in Iraq. 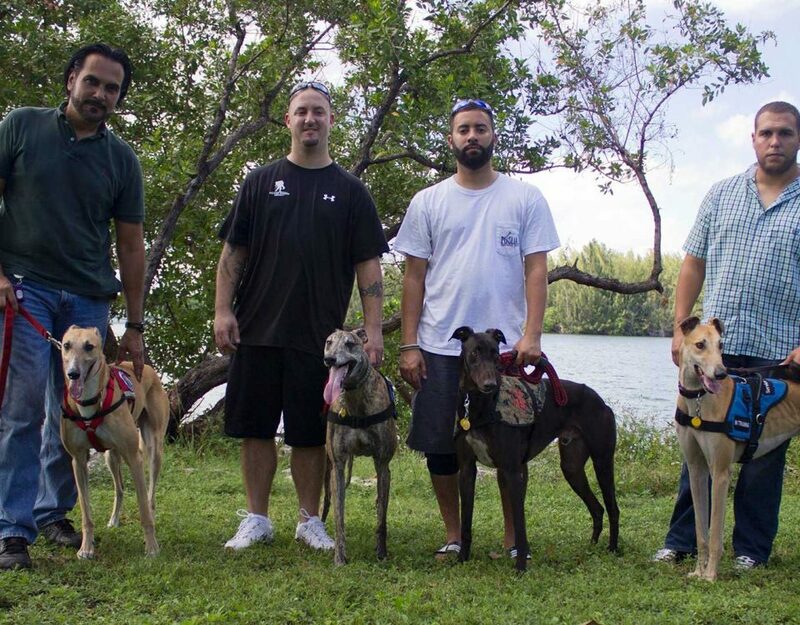 Hero II was the second greyhound to graduate from a special training program developed by Daniel De La Rosa, a certified pet trainer who works out of Petropolis Park, a boarding facility. 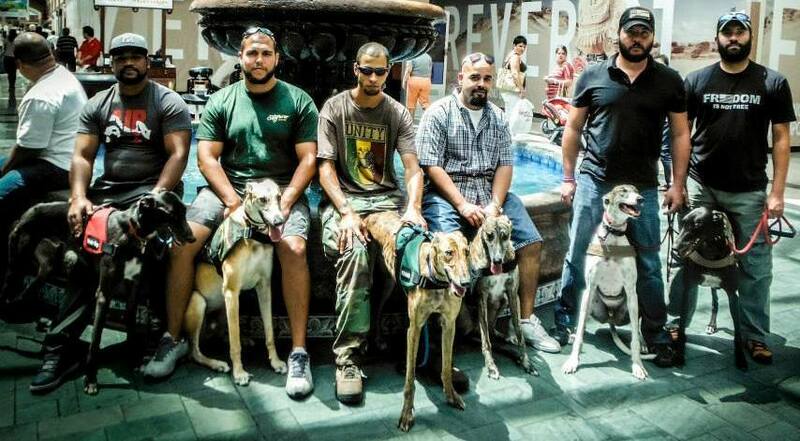 The program teaches greyhounds the usual basic behavioral “sit and stay” commands, but also trains them to help their owners cope with anxiety, depression and fear of crowded places. According to a May 25 article in the online edition of the Palm Beach Post, Offenburger was very thankful for his new four-legged friend. “He’s going to be a great part of my life,” he told the Post.